Medewi Beach is the beach and attractions are quite popular surfing spot. 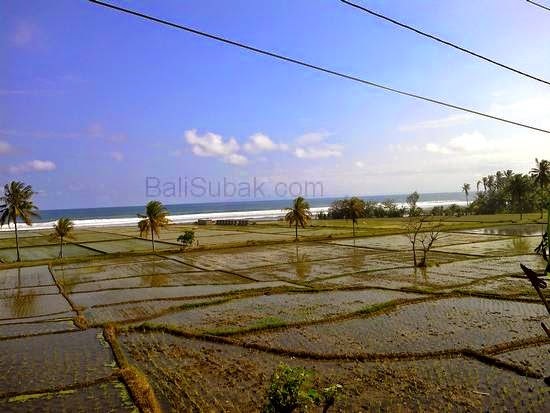 The beach is located in the village of Medewi, district of Pekutatan, Jembrana Regency, West Bali. If reached from Denpasar, you have to go to the west via Denpasar-Gilimanuk Highway, about the distance of 75 km from Denpasar. 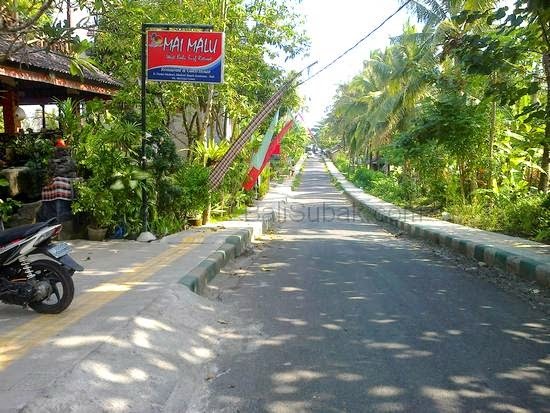 It is located on Denpasar-Gilimanuk Highway towards the beach is 100 meters to the south. Jembrana is not the area that has the potential attractions of interest. But Medewi Beach is the beach that has the highest number of foreign tourist arrivals in Jembrana. Because Medewi Beach is a great place for surfing. Because it has long ocean waves. Medewi Beach has a lot of rocks. So this beach is a unique place for surfing, as it is quite challenging for surfers. Although quite dangerous, it seems surfers love to surf in this beach. Medewi beach threatened by abrasion. Diminishing shoreline abrased by ocean waves due to strong. Even the breakwater embankment at the beach, which protects the beach and around the hotel, damaged by the brunt of the sea waves and strong currents. During high tide, the beach as the embankment retaining sinking, as the sand on the beach is swept away to sea. This condition has occurred in some of Jembrana, the impact on the loss of a number of residential areas, even some temples were threatened by sea waves are getting closer to residential areas. Medewi beach is the beach of the fishermen. Along the beach there are lots of fishing boats. Residents of Medewi are many who work as fishermen. But the income of fishermen here are not as good as in the western region. Not all coastal fishing boat leaning into place. Medewi beach is just a small part of all the segments into a spot of surfing beaches. Most of the beaches are in the area Pulukan village. Medewi village and Pulukan village separated by a river that empties into the ocean where the surfers in action. So most of the beaches are often made ​​surfing spot is Pulukan Coast region. Management at Medewi Beach less serious attention by the local government. Though very good potential as a tourist attraction and surfing spots. Maintenance and repair of shore facilities, mostly by businessmen who founded the nearby hotels in Pulukan and Medewi Beach. The government should pay serious attention to repair levees damaged by the abrasion. If you look carefully, in the Medewi Beach, Pulukan Beach, and Pekutatan Beach, there are many villas and hotels. However, because of the potential of foreign tourists very little, impact on very low incomes. 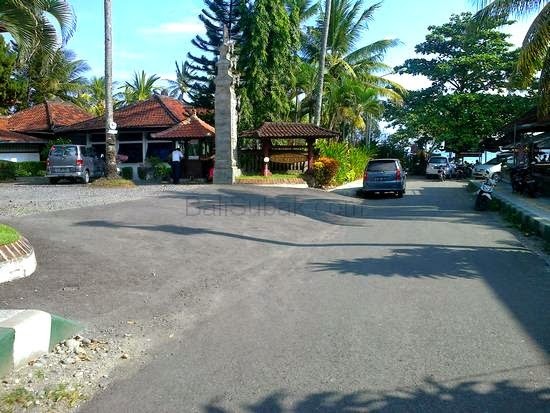 Many villas are for sale by owner because no tourists were staying. Loss that responsibility managers villa largely due to tax payments that are not commensurate with the profit that is generated. Every day there are many surfers who visit and try the sea waves in Medewi Beach. The beach is open to the public. Anyone who visited these shores, is not charged fees. 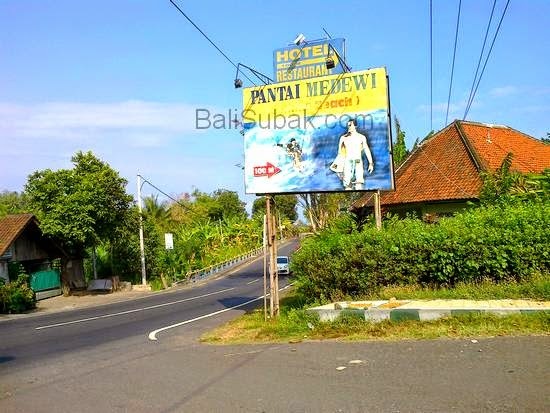 Unlike the other attractions in Bali, Medewi beach region are not well managed and organized. Houses around the beach is not organized, appear dirty and congested. Residents do not see the great potential of the tourism industry. During the rainy season, the river water is in the east on the beach of Medewi be great. This river will bring a lot of trash from the mountain. Leaf litter, wood waste, and waste from homes around the river. When the river floods, the river water became very turbid, and colored brown, brings a lot of mud, sand, and rocks. 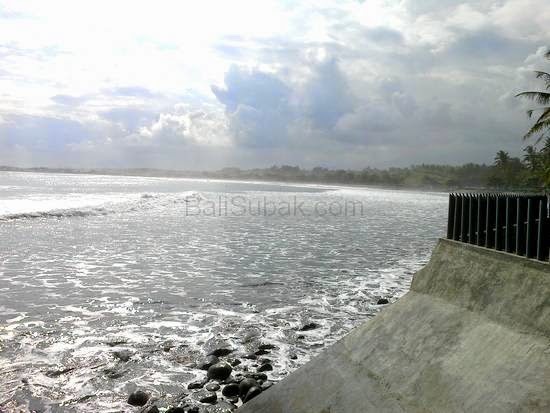 Conditions such as these will affect the quality of the sea water around the beach of Medewi. Become very dirty sea water mixed with mud and trash. Just like in Kuta Beach during the rainy season that is filled with garbage. Almost all the beaches in Bali have the same characteristics during the rainy season. If heavy rains occur, the river water becomes brownish kerus, because mixed with mud. The beach will be filled with garbage, and the sea water becomes very dirty. This happens because Bali has many rivers that empty into the sea. When rain occurs, all the rivers will be flooded and bring mud and garbage into the sea.